I’ve tried some new recipes lately. I wanted to share a few of them with you guys because they were good ones! 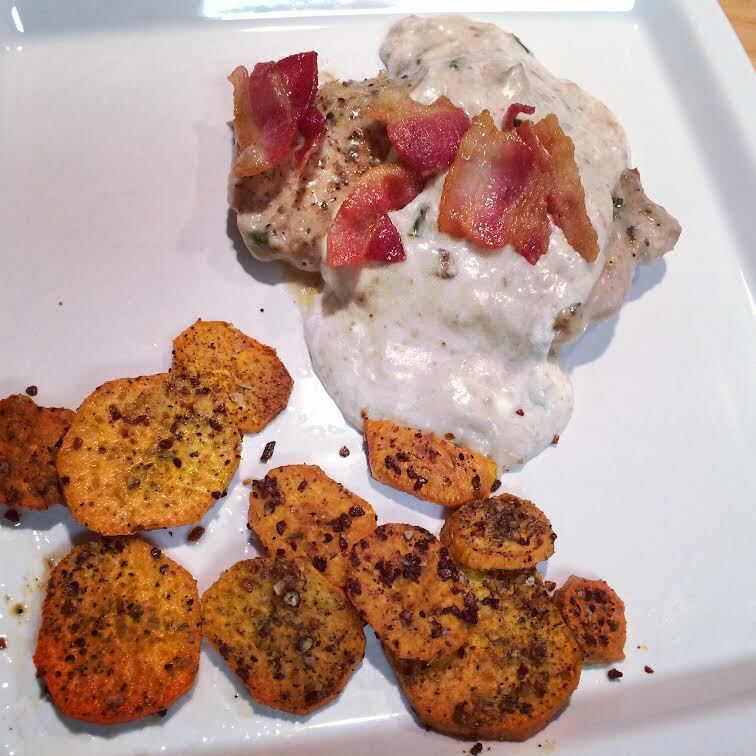 If you are looking for a quick and easy dinner recipe, this post is for you. I am a sucker for “5 ingredients or less” recipes but often times they are disappointing. This one was not disappointing in any way. It was actually one of my favorite new recipes. It was simple, it was easy, it was fast AND it was delicious. The salsa verde made the beef flavorful in a subtle, different way. The best part? I go 4 servings out of this recipe and that made it around 260 calories. Add 100 calories for a tortilla, throw in some raw spinach and avocado and you’ve got a fantastic dinner for less than 500 calories and it’s filling, too. This recipe will become a staple in our house I think. I like that pork chops are low in calories. Sadly, they are also often very bland. If we make pork chops I prefer to try recipes that have some gravy or sauce to kind of freshen it up and make it a little more savory. This recipe was super easy and fairly quick. I had all the ingredients on hand and I am happy with how it turned out. While the pork chops were cooking I baked some sweet potatoes as a side and made a salad. The recipe was simple but I thought it tasted good. It made boring pork chops a little more interesting. I would definitely make this recipe again but I think I would add some fresh tarragon or rosemary to the cream of mushroom mixture. Other than that, I wouldn’t change anything! I recently bought a cookbook of all crockpot recipes (recently meaning this summer). I’ve been dying to try some of them but just haven’t gotten around to it until now. I had all the ingredients on hand for this one except for the quick-cooking tapioca. It’s something I’d never heard of before or used but looking into it I guess it’s used for thickening stews and sauces. When I didn’t have this I went to the handy-dandy Google and found that flour or cornstarch worked just as well. So I used flour instead. I WILL be buying some of the tapioca soon, though, because a lot of the recipes in this book call for it and I want to give it a try. In a small bowl, stir together the cranberry sauce, dry soup mix and tapioca. Cover and cook on low heat setting for 5-6 hours, or on high heat 2.5-3 hours. When the chicken was close to being done, I cooked some rice in my rice cooker that I got at Trader Joe’s. It was a basmati and wild rice mixture with herbs in it. I was excited to try it! The chicken I used was boneless, skinless chicken breasts and it worked well, perhaps not as the recipe intended, but it still worked. The chicken breasts fell apart and I shredded the chicken a bit, then mixed it around in the sauce. I liked the chicken shredded like this. It soaked up all the saucy goodness. I had a few nibbles as it was finishing up and it was delicious! 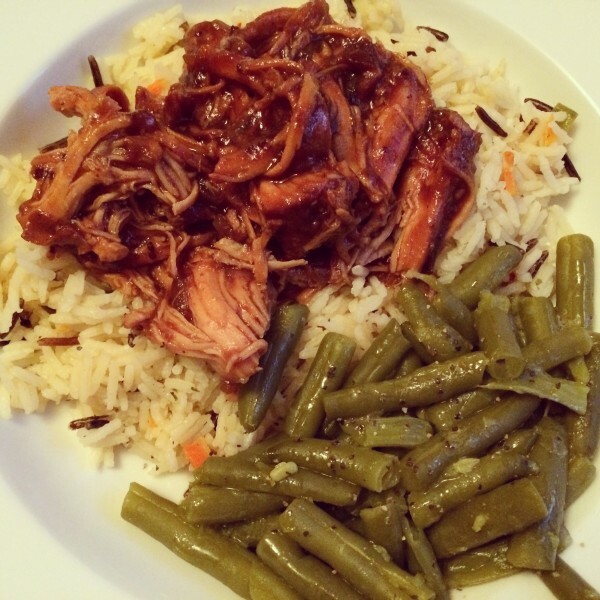 Dinner was finally ready and it was by far, one of my favorite crockpot recipes I’ve done in a long time. The chicken was perfect, not dried out at all, and the cranberry sauce was sweet but not too sweet. It was just perfect. I also loved the Trader Joe’s rice. this dinner was fantastic! Give this recipe a try. Oh – I’m all about crockpot recipes!!! All 3 of these recipes look good and easy!!!! Mmmm that creamy mushroom pork chop recipe looks so very yum!! It was really tasty. I’d make it again. I love all things salsa verde – wish I would have seen this before I decided to have taco night with my daughter tonight! I’m going to try that cranberry chicken over the weekend. You can find tapioca with the pudding mixes or in the baking aisle depending on your grocery store. I use it in my crockpot pot roast recipe. I finally found it! I had to look in several sections at my store and found it. I will try it next time. Let me know what you think of the cranberry chicken. I was a big fan.